Introduction: Naomi Campbell, the famous Super Model of the day is well­known for her modeling career as well as for her violent nature, who hit and assaulted Italian actress Yvonne Scio, her own staff on many occasions and recently, a Police Officer at Heathrow airport. On 10th June 2008, it was mentioned and quoted by Naomi that she has gone through a fertility operation to help her become a mother. This raises curiosity whether Naomi Campbell will bear a child and if yes, how and when? Ganesha has a look at her natal chart on Vedic Indian principles. The eighth house in her chart has Ketu (Dragon’s Tail) indicating biological problems regarding regenerative organs. This combined with Mangal the significator of operations and surgeries placed in the fifth house, indicated child birth through surgery before conception or during the time of delivery. The same planet though indicates abortions too. As we all know now she has undergone an operation on 10th June 2008 to enable her to become a mother. That was all about why she could not become a mother earlier and what delayed it and how she would become a mother. Now let us proceed ahead to answering to when she will become a mother. Well, Ganesha observes and notes that in her Secondary Progressed Chart for 22nd May 2008, Moon (Chandra), becoming the lord of her seventh house of conception as per the Natal Chart and becoming the lord of the fifth house of kids as per the Progressed Chart, is placed in the second house of family, indicating that this year, till 22nd May 2009, is good for her with respect to increasing her family. Additionally Ganesha observes that Mars, (Mangal) the lord of her second house as per the Progressed Chart, is placed in the fourth house of home, again indicating that her family affairs may seem to be highlighted this year and that she may have a child this year or at least conceive. As per the Mahadasha system, Ganesha finds that from 26th July 2008, she will come under the influence of Budha Antardasha in Sukra Mahadasha. As noted above, Budha and Sukra are directly associated with her child­birth issues. Ganesha also feels that especially between 18th February 2009 and 10th August 2009, she may conceive. 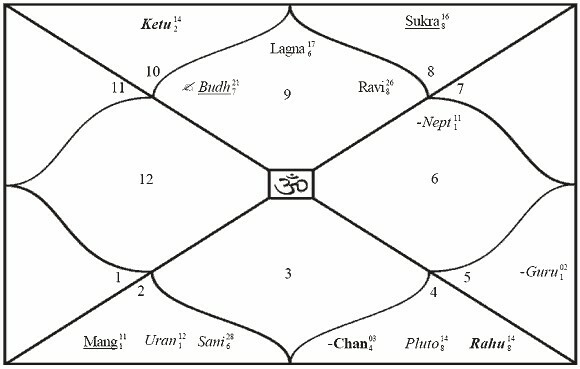 In the progressed horoscope as Sukra (Venus) becomes the lord of the eighth house of operations as well as surgery and is placed in the fifth house of kids, while as Progressed Chandra (Moon) receives aspects from Progressed Ketu, Ganesha is of the opinion that the conception may not be in the natural mode of conception, but some in some different way. Whatever may the mode of conception be, rest assured that Naomi Campbell will definitely conceive in the coming 12 months, that motherhood is not far for her and that she cannot escape it. Ganesha wishes her a happy and fast motherhood as well as a safe and smooth pregnancy.